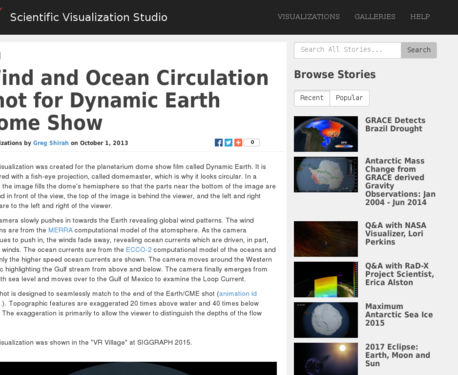 The visualization could be paired with sections of the film [link http://www.dynamicearth.spitzcreativemedia.com/] to show the connections of the wind and currents to Earth's entire system . Educator will have to reinforce with younger audiences how the visualization connects to the Earth's climate system. Visualization can be paused during viewing for educator to reinforce points of understanding. Educator will need to explain what processes are being illustrated in the images. CLEAN resource called the Global Ocean Conveyor Belt found [link http://www.andrill.org/education/elf_activities_3A.html] could pair with this visualization nicely and reinforce concepts. The images in the visualizations begin by displaying Earth's global wind patterns, then zoom in to reveal the connections to high-speed ocean currents. The animation uses data from computational models: wind patterns are from the MERRA computational model of the atmosphere; ocean currents are from the ECCO-2 computational model of the oceans and ice. Comments from expert scientist: It is a neat video. Got the 'wow' factor when it goes under the surface of the ocean. I would show it to students, especially if you're on the East Coast. This animation is a great way to visualize wind and ocean circulation patterns. The high quality of the animation is engaging and would be very useful to explain complex processes that are hard to imagine. The projecting globe is optional - it is not necessary to view the visualization. The animation and still images are easy to access and download.